I love this rather melancholic phase of the year partly on account of the seeming omnipresence of bush crickets in our parish. They are in every hedge, even our own, and walking here along the lanes at evening is to be bathed in their minimal music. 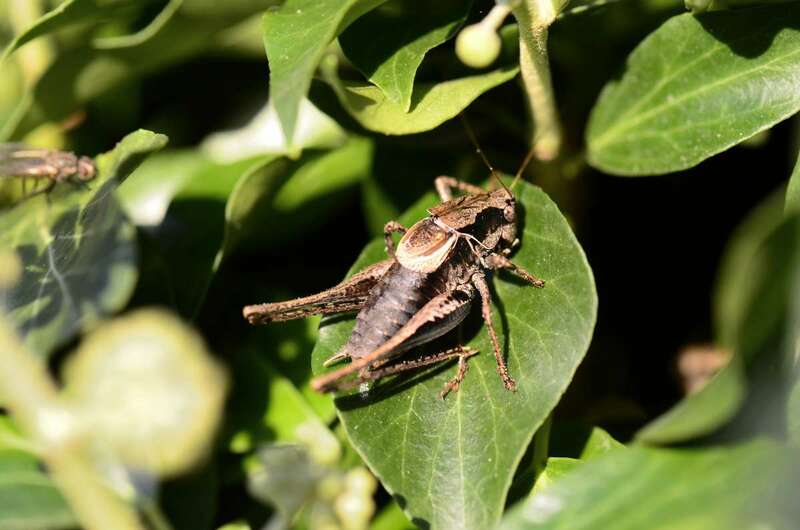 Our commonest species is Dark Bush Cricket. Here’s a male singing in the hedegrow by the house, producing his quiet brief sparse ‘trrrr’ note that is created by the rubbing together of those rough-edged winglets that form a short ‘cape’ round his ‘shoulders’. Less common but increasing is this handsome beasty called Roesel’s Bush Cricket. 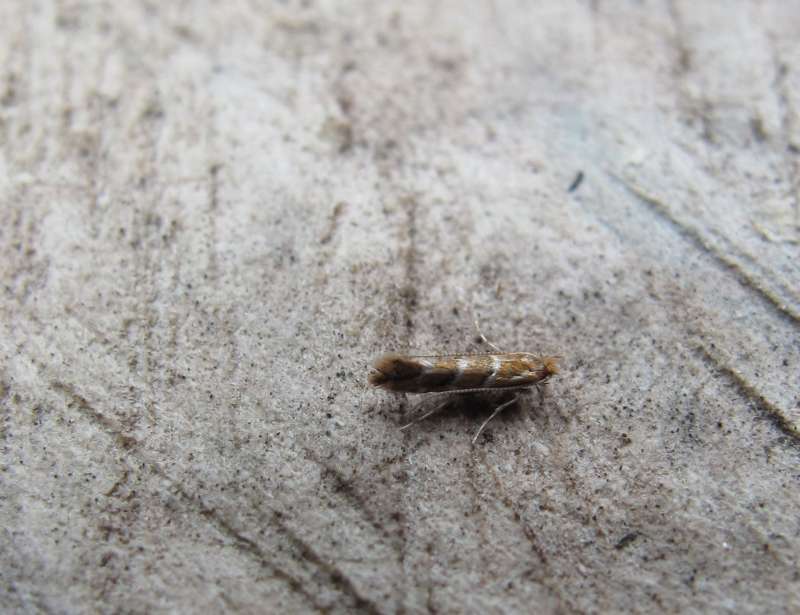 I first recorded it here in 2010 and have still to find it at Blackwater but it is expanding its range very rapidly having only been found in Norfolk in 1997. Roesel’s is superabundant in parts of Essex and south Suffolk. I recently made a five mile walk around Orford Ness and suspect I was never out of earshot of its soft, seductive reeling song. Sadly not one of my three companions could hear it, the sound being in that upper register that is lost with age. 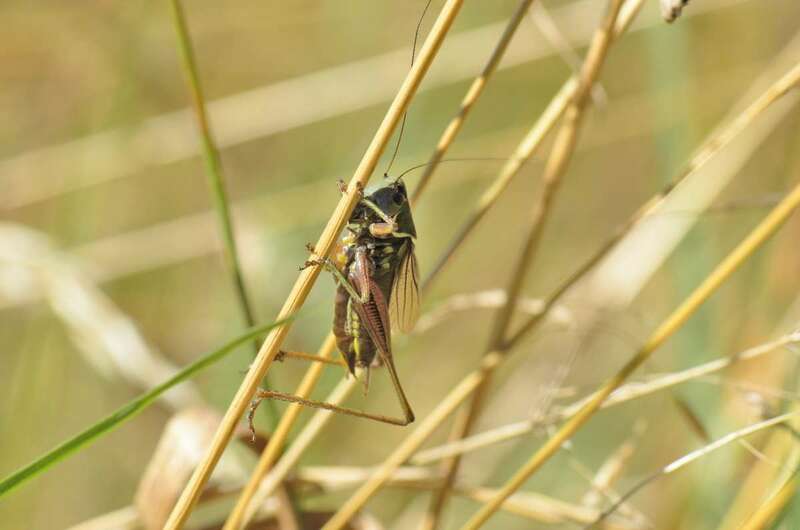 I suspect there were tens if not hundreds of thousands of Roesel’s Bush Crickets on Orford yet I never saw a single one. we could get a shot of the catch. 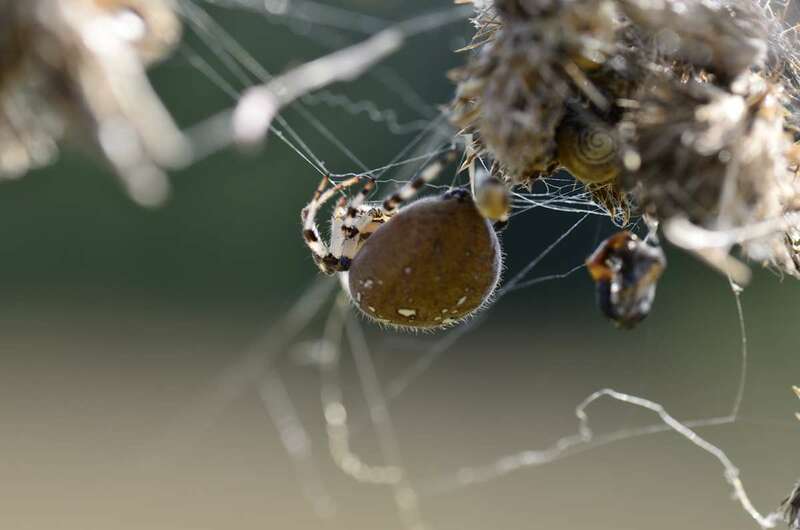 We think that at the time of our encounter with this wasp spider in Adam’s garden – and this is a rapidly moving picture – it had only been recorded in Suffolk on a handful of occasions. And almost certainly no more than 20. It has a fascinating history in Britain, having first been found on the south coast in 1922. From this tiny enclave it has gradually expanded northwards and i await it with interest here in Norfolk. It’s typical of the kind of ludicrous over-reaction to invertebrates in general, and to spider in particular that the Daily Mail carried a headline in 2007 ‘Exotic Spider That Bites Swarming Across England.’ You’ve been warned: the apocalypse is nigh. Apropos of very little but I do think it looks extraordinarily suggestive – like a tiny mahogany icon – is this locally found Four Spotted Web Spider. Who said spiders can’t be beautiful? For the last eight years a group of friends – including any combination of Mark Avery, Tim Birkhead, Mike McCarthy, Peter Marren, Jeremy Mynott and me – has been meeting to talk about life, books and the state of nature, usually to the accompaniment of wholesome food and wine (selected invariably by Mr McCarthy) and against a background of some of England’s best wildlife landscapes. The focus strays between any one of the themes but this last gathering was a special moment and doubly blessed by glorious Indian summer sunshine and that most benign hazy air of the Suffolk coastline. 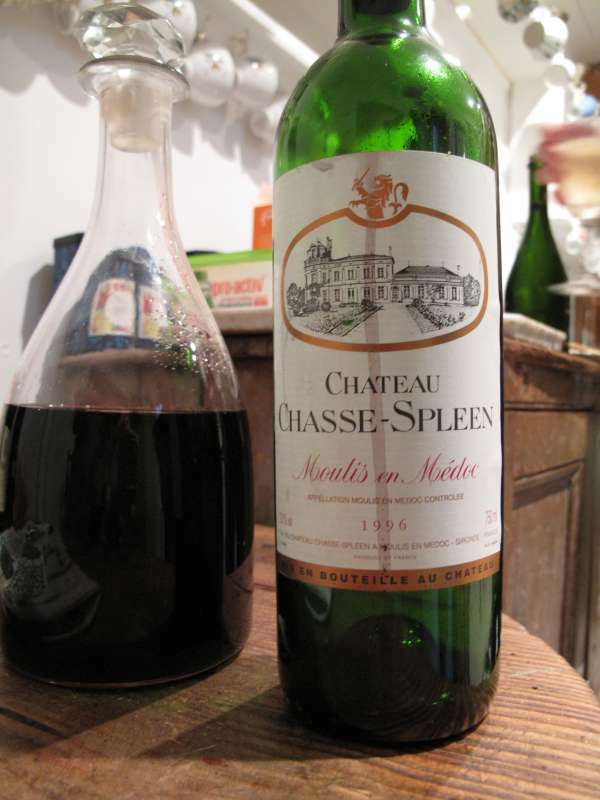 We were also favoured with Mike’s customary gifts of Champagne as well as bottles of Shady Bay Sauvignon and Claret (Chateau Chasse-Spleen) that he had laid down 17 years ago for just such an occasion. Our meetings are convivial but not normally quite so indulgent. However this gathering was special because the four of us (messieurs Birkhead, McCarthy, Mynott and I) have recently written or reached a landmark in our respective book-writing aspirations. Together they add up to a million recently written words. My own contribution was through Birds and People, to which each of the others has given fabulous support over the last seven years. The other three have also turned in some remarkable books. 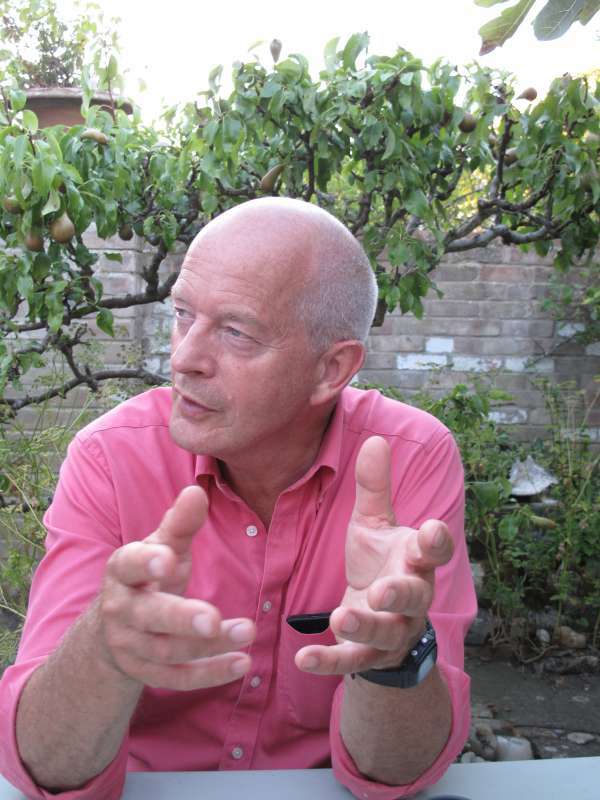 Tim Birkhead, for example, has already established himself as the pre-eminent author of popular science on birds, particularly through his last two books, including the classic Wisdom of Birds (Bloomsbury, 2008), an account of scientific development in the field of ornithology since the days of one of his heroes, the brilliant and polymathic John Ray. Then last year came Tim’s Bird Sense (Bloomsbury), an attempt to describe the world as perceived, heard, felt and interpreted by the avian brain, a book that has taken us as deeply into the world as lived by birds as anyone has so far ventured. His new’un promises to be another classic and deeply complimentary to the previous works. 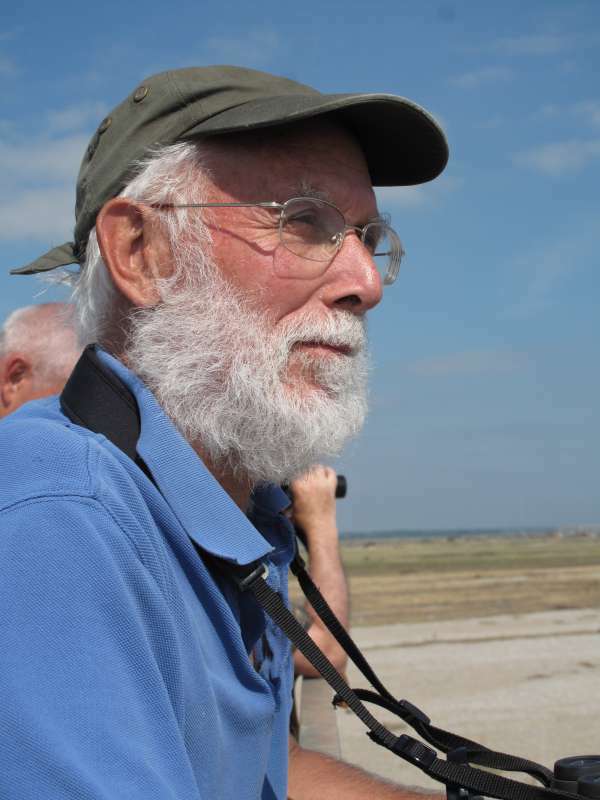 Co-authored with two colleagues, Jo Wimpenny and Bob Montgomerie, Ten Thousand Birds does as it subtitle suggests: it narrates the development of Professor Birkhead’s field since the time of Darwin. It includes copious visual material and tackles key developments in avian science as a sequence of evolving and interlocking dramas, drawing in the key dramatis personae to offer us a comprehensive portrait of both the ideas and the people who advanced them. We cannot wait. 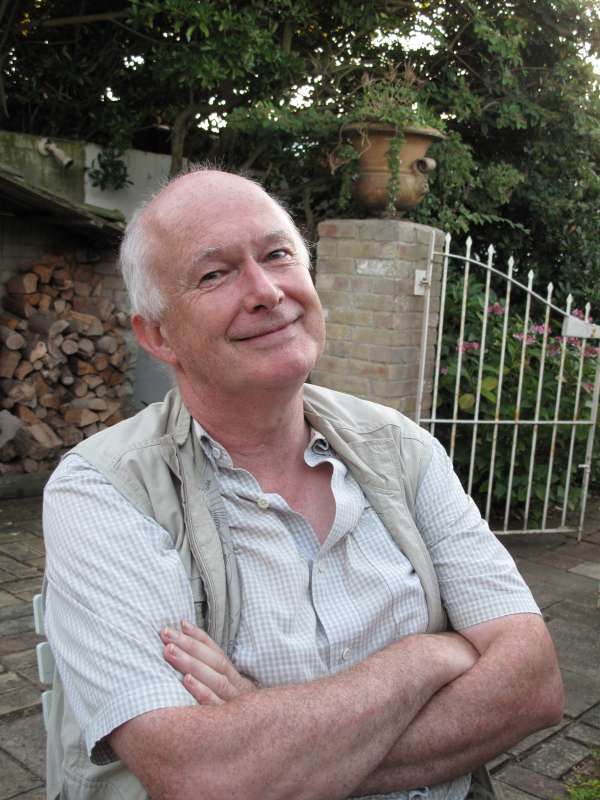 Next in the roster of achievement is Mr Michael McCarthy of The Independent, one of the finest, most effective and highly informed environmental correspondents in the last 20 years. And that achievement doesn’t even touch on his ability to break out into a word-perfect declamation of verse across the spectrum of English poetry. This weekend it was Edward Thomas and Lord Byron. Recent retirement has allowed Mike to forge ahead with a long-gestated work of fiction that is now nearing completion, that has had his agent and the head of a senior publishing house in raptures and which has the rest of us desperate to have the long-awaited tome firmly in our hands. I am sworn to secrecy on its exact content but, as one might expect, it tackles key environmental themes while drawing on this Scouser’s deeply embedded family encounter with the Catholic faith! Roll on 2014. Last of our quartet is Jeremy Mynott, who is proof of the emergent 21st century adage: life begins at 70. For the last five years he has toiled away with loving devotion and Gibbonian stamina on one of the most challenging tasks in Western Literature. it is a completely new translation of Thuycdides’ … well i was going to say Thucydides’ Peloponnesian Wars. However it is a measure of Mr Mynott’s Socratic precept to leave no lazy concept unturned and unchallenged that he has renamed the work to accord precisely with the wording of the Greek original. The War of the Peloponnesians and the Athenians is truly an achievement of Herculean proportions. I have had to divert from my reading of this master work and am only half way through its 690 close typed pages but even an amateur classicist as myself (an E in Latin A level! … but in an age when an E really counted ) can tell that there is something extraordinary about Jeremy’s achievement. The roster of scholars who have attempted to turn this remarkable book into intelligible English is daunting in itself and runs all the way back to Thomas Hobbes. Jeremy has digested all these predecessors but has then approached the original Greek with absolute fidelity. He has especially sought to capture not just the assumed sense but the remarkable, if difficult, dense and coarse-grained engineered power of Thuydides’ prose. He deserves a knighthood for what promises to be one of the most important interpretatons of the founding text of Western history. For now he will have to make do with the congratulations and Champagne toast of his friends and a dozen sublime lines of Byron by the inimitable Mr McCarthy. Friendship. don’t you just love it. The following morning we capped the evening’s celebrations with a visit to Orford Ness. 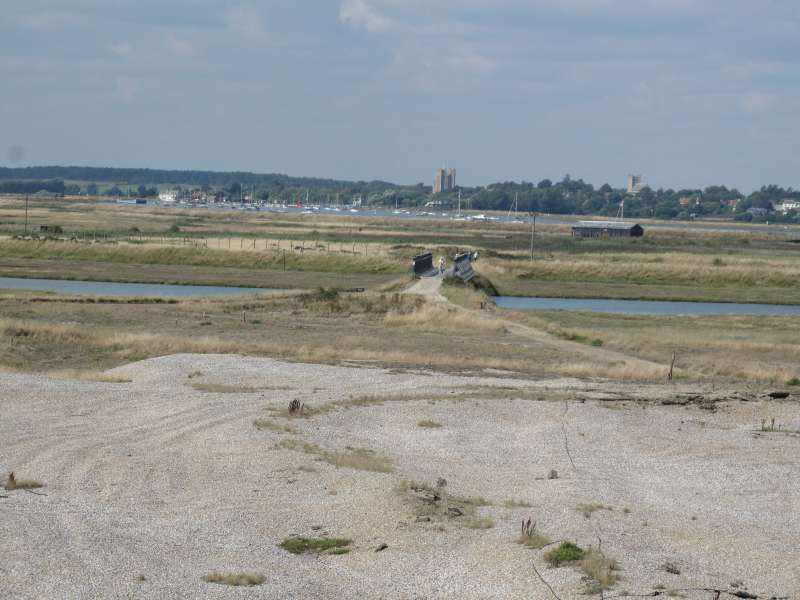 I was recently asked by a wildlife magazine to name my five favourite British nature reserves and now wish I had seen Orford before to be able to include it in that top roster. It is truly glorious. The vast expanse of sea-smoothed stone and shingle vegetation is made all the more weird, eery and compelling by being the host landscape to former MOD facilities where they once trialled Britain’s nuclear deterrent. All that slow-rotting detritus from the Cold War amid a small wilderness of grass and pebble is like being on the set of a J G Ballard novel. The extraordinary moth riches of August have now passed into something more typical of previous years and other seasons. But today’s session in Claxton was not without highlights. 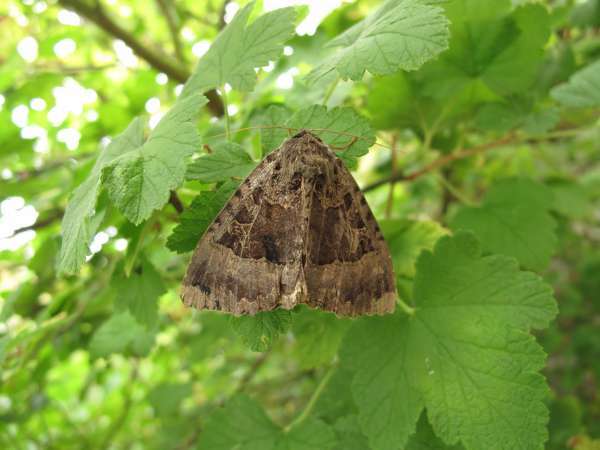 This glorious large Noctuid species is called the Old Lady and it’s a completely new species for the parish and for me. There is something rather ancient and faded about the beast, like some stately grand dame with wings that seem a cross between ancient parchment and Victorian brocade. 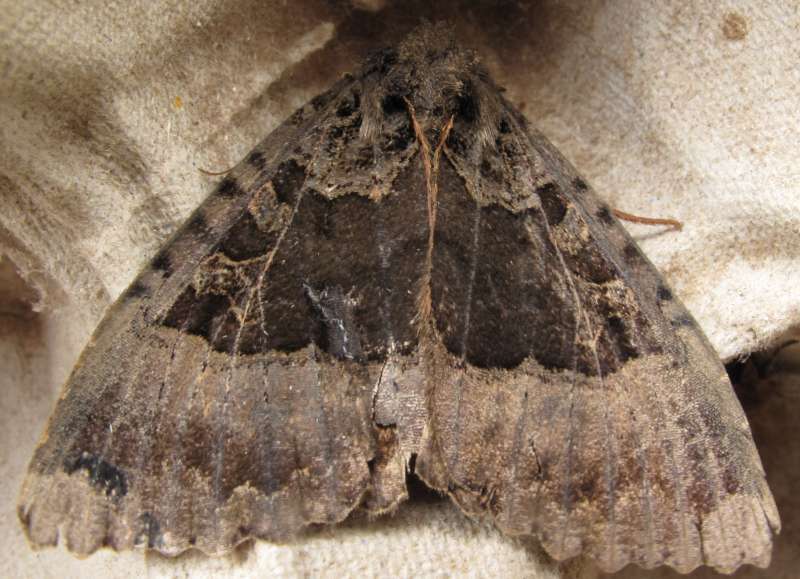 It is local and scarce and was a revelation when i lifted it from its resting place in an old egg box. I’ve tried to show in this next image the ‘aged’ quality to the upper wings. 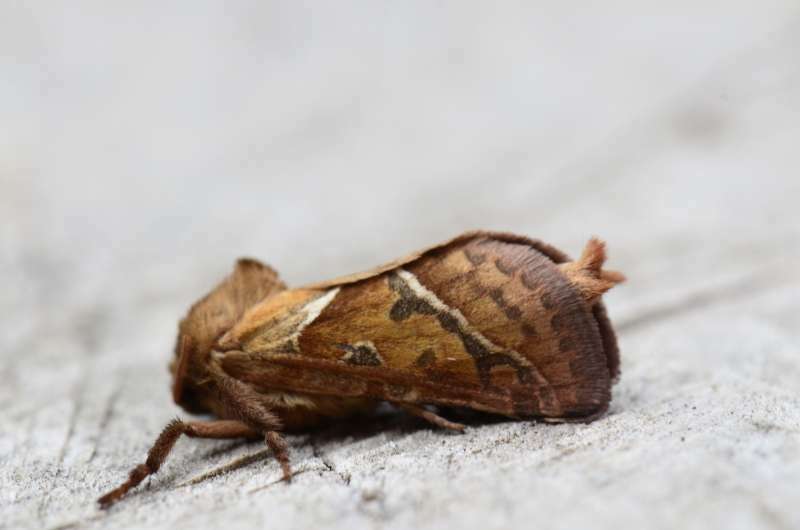 The extraordinary thing about mothing is the way the catch revolves with the season but then, with uncanny regularity, old familiars and beautiful favourites reappear according to date. 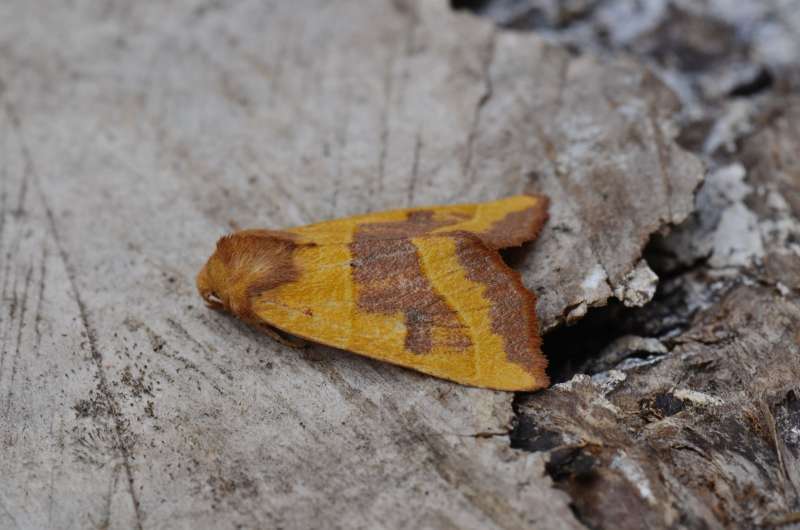 There’s the 1 September and here, about on time, come the year’s first centre-barred sallow and orange swift respectively. However, if one is attuned at all to insects then they also alert you to more momentous climatic and seasonal developments. The next two images (below the centre-barred sallow and orange swift) exemplify these larger changing patterns. The next two creatures are in our garden probably because of climate change. 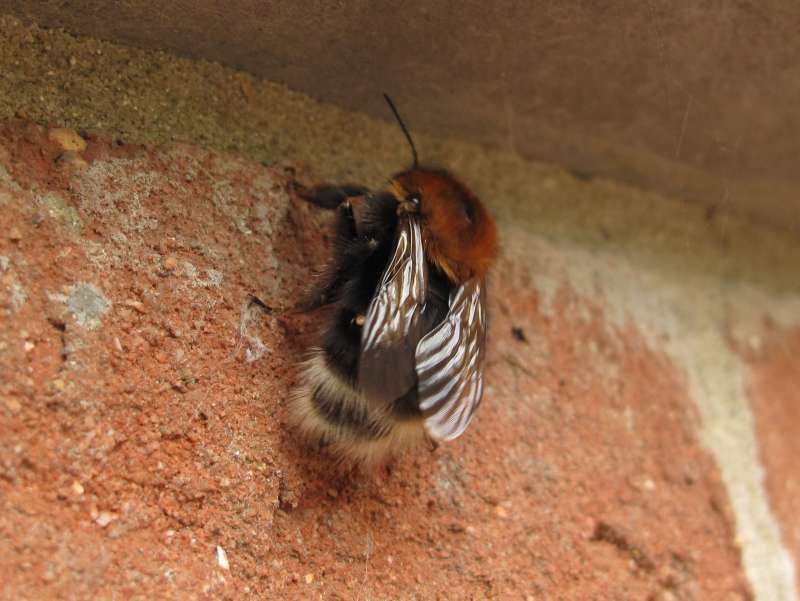 The first is a glorious fresh queen tree bumblebee who is probably looking for a nice niche to overwinter. I spotted her on the wall above the coal bunker and climbed to say hello when Her Majesty promptly landed on my chest pocket. To paraphrase Thoreau with his sparrow, I momentarily wore that bumblebee more proudly than any social insignia or badge I’ve ever known. At the tip of her abdomen you can see the white ‘bottom’ that is the diagnostic feature of this remarkable insect. Recall if you will that it has now reached Iceland. Yet the first British record was in Southampton (recorded by Dave Goulson) 2001. Tree bumblebees are everywhere in the UK and have been especially abundant in Claxton this summer with a nest above my office.